It is with great pleasure that I write to you tonight. My experience in Rome this year of 2011 was absolutely great. We accomplished all that we set out to do, and more. As many of you know I went the first year in 2008. It was a good beginning. There were 10 of us then. I did not go in 2010. The third year was a charm. I feel tremendously encouraged about our movement. I feel we are moving forward. I could feel the Holy Spirit moving us along while in Rome and this time there were 16 of us...women, men, young people, womenpriests, and male priest. United in purpose, in solidarity and love. All of you were with us too. When I arrived I had to wait for Janice, Dorothy and Donna so I played my drum for about an hour, calling upon Creator/Spirit to be with us and to surround us with serenity and God's patient love. We all felt that special quiet peace within when we met together that evening. On Monday we went to the Gravina hotel to view "Pink Smoke over the Vatican" with anybody who decided to attend. Following the showing of the movie we had a press conference. Several people spoke proclaiming support for womenpriests, and the fallacies of the hierarchal churches attitude toward women. Following brief questions from the media, they followed us as we began our march to Vatican square. Janice, Donna, and I were dressed in albs and stoles. We were holding on to signs, singing and chanting. The greatest chant ,as we neared the gaited vatican, blocking us from entering the square was: WHAT DO WE WANT? 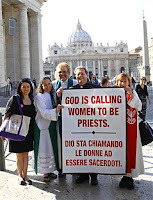 WOMENPRIESTS . WHEN? NOW! When we arrived at Vatican square the police stopped us, some of them smiling at Erin (WOC) executive director, saying ,"Back again.?" Then the incessant conversation began. We were told we could not gop in the sqare because we had no permit. We told them we had applied but didn't get anywhere., whereupon we were asked who we talked to. This was a laughable question as who knew? They began taking passports. This brings up my first personal point: Both times I went to Rome I was not asked for my passport. We had signs, professionally made. I was on the end in the middle of the road carrying the purple sign that said Ordain Woman. Roy had a beautiful white and red sign with the same words in English and Italian. The police just glared at 71 year old me in Alb and stole, grimmaced, and said nothing. They looked at Roy obviously dressed in the outfit of a cleric. They addressed him as Papa, turned to Erin and resumed talking. Our other friends stood back as witnesses to the whole event. We kept insisting that they let us on the square. The police leader called headquarters to talk to their superiors. After the discussion the policeman said, "No signs." We asked why as we saw signs everywhere in Rome. THe answer was, "They have permits and you are inciting to riot." "You there (speaking to the three of us in albs), absolutely cannot go into the square because you are directly challenging the law by being dressed the way you are." "Allelia, I'm a priest challenging the law, I yelled, and guess what these albs won't go away and neither will I, whereupon I yelled, 'WHAT DO WE WANT? WOMEN PRIESTS," yelled the group. "WHEN," said I;" NOW," said the group. Personal point number 2.....We must wear our Albs and Stoles without apology because they are a testament to our priesthood and a rich, wonderful sign of who we are. Wearing them makes the church heirarchy uncomfortable which means they cannot help but recognize that we are priests serving God and God's holy people. The police suggested that Roy go in to speak to the people by himself since he is a priest. This, of course was suggesting that we weren"t. Roy said, "No,a womanpriest would have to come with him." My heart jumped at his open display of support. This is point three: Open support. Silence kills. We began moving closer to the gates. Janice and I were right by Roy when all of a sudden a young man, dresed like an ordinary Italian citizen. He pushed toward Roy to take his sign. Roy resisted, and told them the sign was expensive and he wanted to keep it. The man pushed again and another policeman, to his right, pressed on his arm using a pressure point. WIth the look he gave me, I stepped back. The police took both signs and refused to give them back even though we had followed their directions. With this incident the whole group began to heat up and things looked like they could get nasty. During the entire affair a wonderful young woman, was speaking Italian and interpreting everything that was said. At the beginning everything was peaceful and courteous, but with the sign incident it began to get more serious. Soon a police car was brought forth and Erin and Miriam (Interpreter) were arrested. Roy was forced back and stood beside me. We watched them wisk the two young women away, blue lights spinning and sirens blasting. At that point we thought they were not going to arrest Roy and were standing there considering our next move., when all of a sudden two of them came, out their hands on Roy, put him in a police car, and sped away wih him.After the women and Roy were taken away Janice said we've got to do something to get arrested. She and Donna decided to try to cross the fence and go to the bathroom. They were stopped, had their passports taken , and were brought back to where I was standing and watching. Within a few minutes they brought back their passports. One: They were not going to let us set foot on the vatican square with those albs on; Two: THey were not going to arrest us because it would acknowledge our priesthood. At this point, Bill Quigley, lawyer for Roy and Janice, and a professor at my alma mateur, Loyola of New Orleans, Came forth and said, "Ree, should we go get them out? I replied that we should do our best. So walking all over Rome we all found the police station. They were sitting inside waiting and we waited outside at an outdoor sidewalk cafe. Aftr a couple of hours they emerged from this station. The man who shoved Roy came out on the street to smoke with another man. I pointed him out to Janice. I looked around and Janice was talking to him. She was right in his face like a mother talking to her naughty son. "You did something very bad, she said. 'You hd no right to push that priest. He didn't do a thing to you, and you did not have a right to take the banner."" I was laughing my head off. That little bitty red-haired woman, in her alb, right in this policeman's face, who did not understand a word she was saying to him, until the man who was with him explained. He looked very embarassed, and seemed not to know what to do. Janice just kept on and I stood as close as I could get. Finally he went back into the police station and we went up the street to the restaurant to remove our albs. Again I reiterate that the one thing I know from this incident is that when one puts the alb on, a statement is made about our priesthood, and how important it is , especially to those whom we are challenging. I will always wear my alb. I will be buried in it. This day, October16, 2011 was a marvelous success. Publicity went everywhere....all over the world. I felt really good about being with these wonderful, committed people, standing up for what they believe in, and continuuing to be a voice for those who are not heard. I am so grateful to my God for calling me, and sending the Holy Spirit to prompt me to do what is necessary to be a voice for God and God's holy people. I will keep persisting, along with these other wonderful people, and all of you, until the hierarchal church changes its mind and treats all humans with dignity and respect. I am not angry, just persistent, and convinced that God wants all people to act upon the gifts and callings they have received. Charge onward dear sisters! Ordaining women deacons could be a first step, but it must be followed by ordaining women priests and bishops. This is an issue of justice and equality in the church. 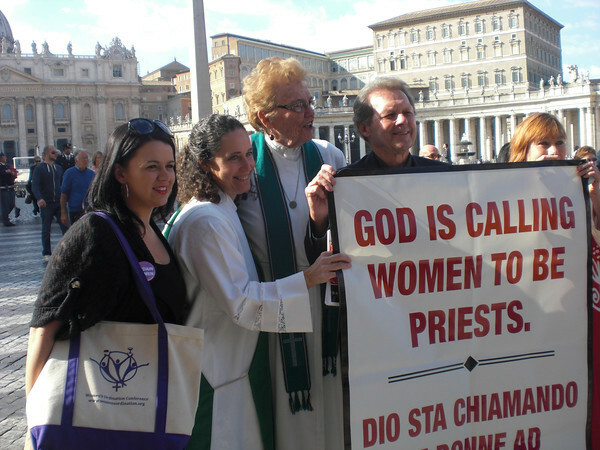 It is a major reason that Roman Catholic Women Priests are ordained in apostolic succession so that justice is a reality for women in the church. The Catholic Church needs women's experiences now in all three ministries and in a non-clerical model of priestly ministry united with the people we serve and with whom we serve. Scholars conclude that the church had women deacons and priests for the first twelve hundred years of church history, so church tradition supports this step. However, the most important argument is that women priests enflesh the teaching that by our baptism in Christ, all are spiritual equals. 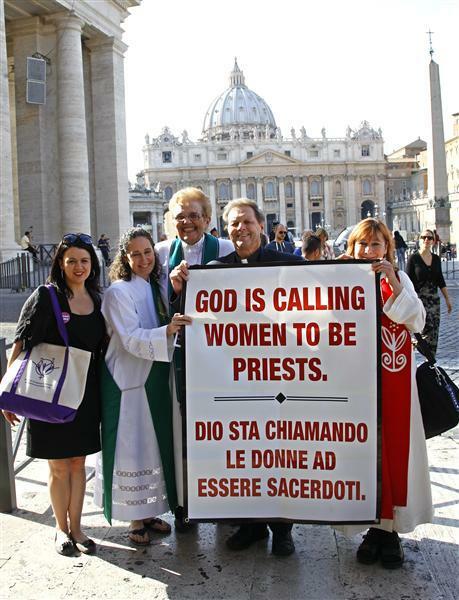 So for justice and equality to be a reality in our church, we need women priests now. We are visible reminders that women are equal images of God. The institutional church leaders, the hierarchy and Vatican cannot continue discriminating against women and blaming God for it! 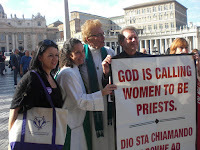 Women priests are the holy shakeup ushering in justice and equality in a more open, inclusive community of equals. The time has come and it is now. How breathtaking the land is bordering the Rhine River in Germany where Hildegard lived and prospered. For so many years I have listened to her soaring yet haunting music and now I understand how the river’s water and the movement of its swaying flow influenced her music. I, too, grew up around water, the Kinnickinnic River “creek” and Lake Michigan. This is what Hildegarde says about her music.“Underneath all the texts, all the sacred psalms and canticles, these watery varieties of sounds and silences, terrifying , mysterious, whirling and sometimes gestating and gentle must somehow be felt in the pulse, ebb, and flow of the music that sings in me. My new song must float like a feather on the breath of God.”Like the movement of the water and the creative Holy Spirit that radiated from her being, Hildegard could not be contained. Writer, prophet, composer, playwright, herbalist, painter, woman who challenged kings, popes and men, Hildegard’s talents accord her the title of Holy Renaissance woman hundreds of years before that Age began.“She even wrote on medicine and nature -- and it's important to note that for Hildegard of Bingen, as for many in medieval times, theology, medicine, music, and similar topics were unitary, not separate spheres of knowledge.” Jone Johnson Lewis, The Legacy of Hildegard of Bingen. Most of Hildegard’s music honors Mary and the saints as she and her sisters sought hope and comfort from the wisdom of their lives. As abbess of her community, her music was performed each day for four hours of liturgical chanting by a choir of nuns. To Hildegard, joy is an awareness of God’s secrets. She asks the question, “Can we see God?”Her answer to how we can become conscious of Holy Mystery is in the life-force all around us, as expressed in Psalm 19, suggests author Carmen Acevedo Butcher in her book : Hildegard of Bingen: A Spiritual Reader.. The opposite of ‘greening’ she saw as spiritual depression. However, we can be revitalized by viriditas, which comes through God’s grace. This greening force animates every plant and being on the earth with verdant divine love. We walked around the cloister, the Benedictine Abbey of St. Hildegard at the top of the hill in Eibingen, that was built in 1902 in her honor. Then we drove further down the hill and through the village to the church where her remains are kept on the altar. The church has an elegant feminine feel to it, filled with soft yet regal blues and golds. Above the altar is a painting of her in a sun-like gold circle fitted within a purple rectangle immersed in a royal blue background. Donna and I were grateful to visit this church. At the side altar stood a statue of Hildegard with a pen in her hand. We each lit a candle and gently prayed. In the book beside her statute I wrote: “With gratefulness for your guidance and direction.” Then I signed my name and after it, “Roman Catholic Woman Priest.” I believe Hildegard is singing with joy for us ordained women priests while praying for the full greening of our church and world community. Roman Catholic Women Priests, Suzanne Thiel and Juanita Cordero attended the Conference on Catholic Ministry- United in Faith at the University of Dallas, Texas today. Here is a clip of Cardinal George's address on "Lay Ecclesial Ministry." Go to Facebook link to hear Suzanne Thiel's challenge to Cardinal George. baptized. What a joyful day! "We never thought it would end up on a hard wooden bench inside a police station in Piazza Cavour. Maryknoll priest Fr. Roy Bourgeois, young Erin Saiz Hannah of Women’s Ordination Conference in the US and Miriam Duignan from Womenpriests.org from the UK were sitting there when my wife and I arrived. They were being detained by the Rome police. The group ended their Roman pilgrimage with a simple rooftop liturgy presided over by the women priests. Bread and wine were shared as people sang “Here I am, Lord.” In the background, the sun was setting both on the great dome of St. Peter’s Basilica and the men inside who think only they run the institutional church."